Are you looking to upgrade the exterior or your BMW E90 3 series sedan? 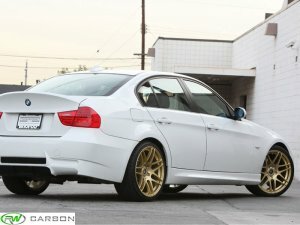 Look no further, as RW Carbon has just what you are looking for with these E90 M3 Style side skirts. These are perfect to complete your the exterior appearance of your BMW 3 Series. Our side skirts are made out of nothing but high quality polyproplyene which is the same material used on the real OEM M3 side skirts. Even though these are high quality and fitment is top notch, professional installation is required. The M3 side skirts come raw and will need to be test fitted, prepped and painted before install.